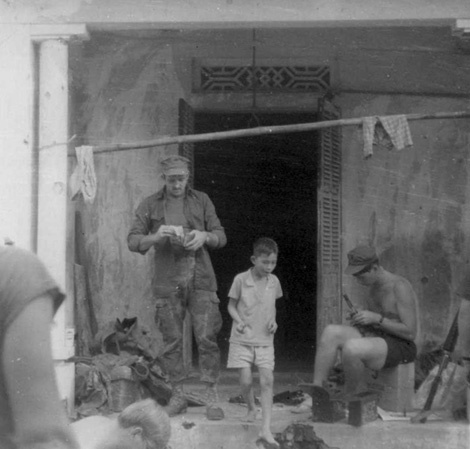 Here’s a photo Doc Doggett took at the daysite we called “The Balcony.” The Vietnamese kid in the center often ran errands for us, so he may have just delivered a soda or something to Scottie Shirley, who is putting away his change. The kid looks like he’s eating something, so he was probably rewarded with food or candy. Roch Thornton sits at right, cleaning his M-16, and Ken Duncan’s head is visible at lower left.